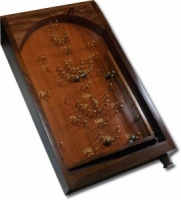 Dating back to the taverns of medieval times this game was originally known as 'Shoffe-grote'. 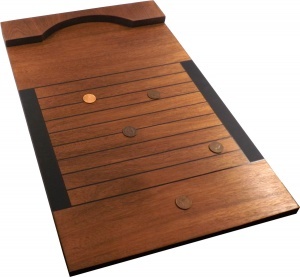 Still popular today, Shove Ha'penny sees players attempt to push coins so they land between the horizontal lines (beds). The objective is to push the coins so that they land squarely in the beds without touching the horizontal lines. 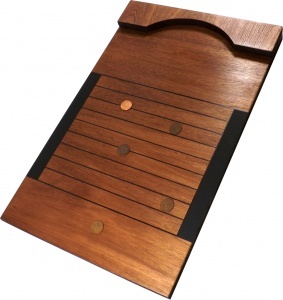 This hand made board is constructed from veneer wood and includes five real old half pennies, scoring chalk and instructions. 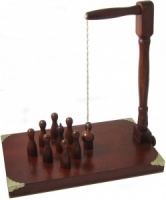 Shove Ha'penny is a very old English pub game played by two people or two pairs. The board is placed flat on a table so that the bar underneath is against the table's edge. 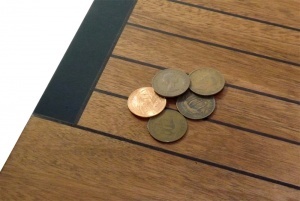 The ha'pennies are placed partly over the edge of the board, one at a time.A sharp tap with the ball of the palm will send the ha'penny up the board. The object is to slide each ha'penny up the board and get it to stop between two lines without touching either, in which case it scores. The area between the lines is known as a 'bed'. The first player or pair to score three times in each bed is the winner. The beds can be filled in any order. Once a bed is filled it can be marked with chalk on the scoring area on the side of the board. If a player scores more than three times in any bed their opponent gains the score. This rule applies unless it is the final point of the game. A player can only win the last point with a clean shove, not by default. Each player shoves five half pennies in each turn. If a ha'penny stops on a line it does not score, so the player may try to bump it into place with his next shot. 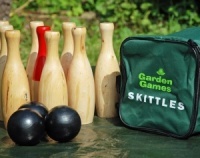 This is known as cannoning and is an important feature of the game. 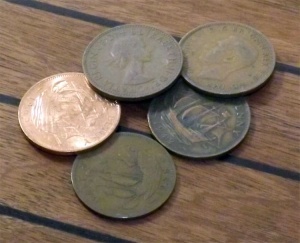 All ha'pennies are left in place untill all five have been played. They are then gathered up for the next player's turn. Learn more about Shove Ha'penny on Wikipedia.